When he died in January of 2009, today’s Pinstripe Birthday celebrant was 100 years old. He had become the oldest living MLB player and his book, Memories of a Ballplayer, co-written with baseball historian, Paul Rogers in 2001, represented his eye witness account of what playing in the big leagues was like back in the 1930s. 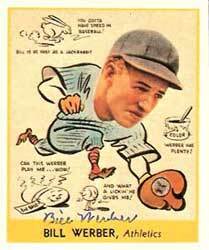 Werber’s Major League career actually began back in 1927, when he was a freshman at Duke University, where he was a brilliant athlete (the first Duke basketball player to be named All American) and a brilliant student (he graduated Phi Beta Kappa.) The legendary scout, Paul Krichell signed the first year collegian to a Yankee contract and had him spend a couple of weeks during that ’27 season sitting on the bench of the famed Murderers Row team to pick up some knowledge of the game. According to Werber, he hated those two weeks because everybody simply ignored him. He didn’t make it back to Yankee Stadium until 1930 when he got called up in June and appeared in three games at short and one at third for Manager Bob Shawkey’s team. He went 2-3 in his first big league start and also became Babe Ruth’s bridge partner on the train rides during Yankee road trips. Werber and Ruth would play partners against Lou Gehrig and Bill Dickey and Werber remembered in his book, how Babe used to drink a bottle of Seagrams during those contests, gradually getting drunker and nastier as the game progressed. Werber spent the 1932 season back in the minors and then was promoted back to the parent club when the ’33 season started, but not for long. The Yankees had a ton of left-side infielders in their organization back then, so they sold the native of Berwyn, Maryland to the Red Sox. That was the break Werber’s career needed. By 1934, he had become Boston’s starting third baseman and that year he reached the 200 hit mark for the first and only time of his career and led the AL with 40 stolen bases while batting .321. He ended up winning a total of three AL stolen base titles. Werber played until 1942 and finished his 11-year career with a .271 batting average and 1,363 career hits. He won a World Series ring in 1940 with the Reds. He was instrumental in Cincinnati’s victory in that seven game Fall Classic, as he smacked ten hits and batted .370. Update: The above post was last updated in June of 2011. Since that time I have learned that when Werber left baseball in 1942, he sold life insurance for his father’s company. He evidently was pretty good at it because during his first year in that new career he earned over $100,000. When he retired from his second career he was a millionaire. I also learned from an interview with Werber published in a 2008 edition of the New York Times, that he was not Ruth’s bridge partner on those long-ago Yankee train rides but instead it would be him and Dickey versus the Bambino and Gehrig. According to Werber, Babe and the Iron Horse weren’t too bright so he and Dickey would always win the $3.50 pot from card games. When Werber walked in his first ever Yankee at bat, Ruth came up behind him and hit a home run. Werber decided to take the opportunity to show his teammates just how fleet afoot he was and ran around the bases as fast as he could in front of Babe. When Ruth caught up to him in the dugout, he patted the rookie on top of the head and told him, “Son, you don’t have to run like that when the Babe hits one. Del Paddock is one of two not-well-known former Yankee franchise infielders to celebrate their birthday on June 8th. Paddock played 46 games for New York way back in the 1912 season, when they were still known as the Highlanders. He could hit decently, averaging .288 for New York that year, which was higher than any of the team’s starting position players could manage except for outfielder Birdie Cree. Paddock’s problem was fielding. He evidently had hands of stone, committing 14 errors in 41 games. Evidently, Paddock’s poor fielding wasn’t the only problem with the 1912 Highlander team. That squad ended up with the worst regular season record in Yankee franchise history, going 50-102 and finishing dead last in the league. Paddock was released by New York after that one season. He would spend the rest of his playing career in the minors and eventually fight in WW I. Paddock died in 1952, two years before this one-time Yankee infielder who shares Paddock’s birthday was born. 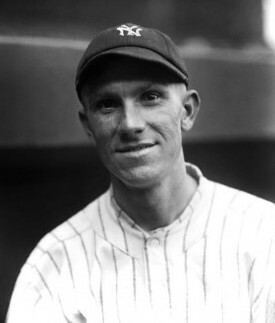 By the time the Yankees purchased Ernie Johnson off waivers just before June of the 1923 regular season, this Chicago native was already 35 years of age and had eight seasons of big league baseball under his belt. The Yankees were looking for a better offensive player to take over for Mike McNally as their infield utility guy and though Johnson was not a great hitter, he had averaged .295 as the White Sox starting second baseman just two seasons earlier. He had then ticked off that team’s owner Charley Comiskey, when he demanded a salary increase, Subsequently, when his batting average fell forty points in 1924, he lost his starting job to a guy named Hervey McClellan and Comiskey gladly put Johnson on the waiver wire. It actually turned out to be a great move for both the infielder and the Yankees. 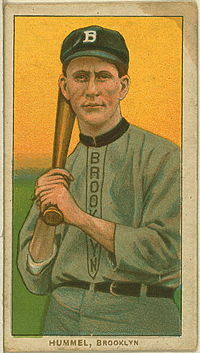 Over the two-and-a-half seasons he played for New York skipper Miller Huggins, Johnson appeared in 159 games and averaged a very robust .327. He also won his one and only World Series ring in 1923 against the Giants and scored the go-ahead run as a pinch runner in the final Game of that Fall Classic. Its too bad Johnson didn’t get to put on the pinstripes much earlier in his career because by 1925, he had already turned 37-years-old. The Yankees decided to go with some much younger blood. The veteran infielder was one of three players New York traded to the St. Paul Saints in exchange for a 20-year-old shortstop named Mark Koenig. Johnson played four more seasons of minor league ball before hanging up his glove for good. He later became a scout for the Red Sox until he passed away in 1952 at the age of 64. His son Don followed the old man to the big leagues and was a starting second baseman for the Cubs during and after WWII. Johnson shares his April 29th birthday with this Yankee pitcher from the nineties, this one from the fifties, and this other one from the forties. There are also a bunch of good players named “John” on the all-time Yankee roster. My top five list of Pinstripe John’s would include: Johnny Damon, John Wetteland, Johnny Blanchard, Johnny Lindell and of course, two-time Yankee 20-game-winner, Tommy John. There was also the only Yankee player named “John” to make it into Baseball’s Hall of Fame. That would be the Big Cat, Johnny Mize. The deal that made Larry Milbourne a Yankee for the first time became part of Yankee trivia history. In November of 1980, the Seattle Mariners traded Milbourne and a player to be named later to New York for catcher Brad Gulden. The following May, the Mariners completed the trade by sending Gulden back to the Yankees as the “player to be named later” part of the trade. This made Gulden the only player in franchise history ever to be traded for himself. Milbourne would go on to have his best big league season during his 1981 Yankee debut. He played sparingly but well as a pinch-hitter and back-up infielder during the first half of that season, which was split in two by a players’ strike. In the second half, he took over as New York’s starting shortstop after Bucky Dent tore a ligament in his hand at the end of August. The League’s embarrassingly bad decision to award team’s with the best pre-strike records a postseason spot gave the Yankee players little motivation to give a damn during the second half, but Milbourne impressed everyone with his grit and hustle as he filled in for Dent. He then hit a combined .363 in New York’s ALDS and ALCS victories that postseason and though his bat cooled off a bit against the Dodgers in the Series, Yankee fans like me were very grateful for his better-than-expected performance. Milbourne also loved playing for New York and told reporters he was so happy wearing the pinstripes, he’d prefer staying with the Yanks and backing up Dent and Willie Randolph to starting for any other team. But after getting off to a horrible start in 1982, he was traded to the Twins in May of that year in the deal that brought Butch Wynegar to New York. The Yanks brought him back to New York the following year but traded him back to the Mariners after he hit just .200 in 31 games. His final big league season was 1984. Nicknamed “the Devil,” Milbourne was born on Valentine’s Day in 1951 in Port Norris, NJ. He shares a birthday with this Hall-of-Fame Yankee announcer, this former Yankee relief pitcher and this one-time Yankee pitching prospect. Brian Doyle’s big break took place on September 29, 1978 during the bottom half of the eighth inning of an afternoon game between the Yankees and Cleveland Indians, at Yankee Stadium. It was a critical game for New York. Bob Lemon’s team had come from eight and-a-half games behind Boston in late August to catch and pass the Red Sox in the AL East standings. But Boston was hanging tough. When they took the field against the Indians that day, the Yankees were on a four-game winning streak but still only had a one-game lead over the resilient Red Sox. The game against Cleveland had turned into a pitchers’ duel between the Yankees Jim Beattie and the one-time Ranger phee–nom, David Clyde. The Yankees were behind 1-0 when Lemon sent up Cliff Johnson to bat for Bucky Dent to lead off the inning, and Johnson worked a walk off Clyde. 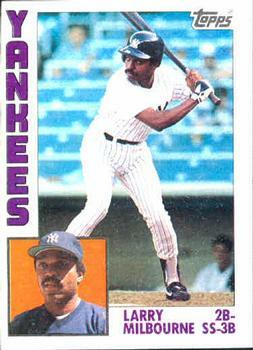 The Yankee skipper then sent Fred Stanley into run for Johnson and he had Mickey Rivers sacrifice “Chicken” to second. That brought up Willie Randolph and it brought Cleveland manager Jeff Torborg out of the dugout to make a pitching change. He brought in the tall right-hander, Jim Kern to face the Yankee second baseman. Randolph hit a slow roller down the third base line toward Buddy Bell, who, at the time, was well on his way to becoming the premier defensive third baseman in the American League. Knowing Bell had a strong arm and hoping Stanley could get to third on Bell’s throw to first, Randolph most certainly attempted to turn a higher gear on his sprint to first. He did beat Bell’s throw but in the process he pulled the hamstring in his left leg. As Randolph limped his way toward the Yankee dugout for treatment, he passed Brian Doyle, who Lemon had sent in to run for him. But Doyle’s walk that day did not stop at first base. Instead, it took him to a special place in Yankee lore. Doyle would end up playing just 93 regular season games during his three-year Yankee career, but this Glasgow, KY native’s 1978 World Series performance was one of the best and most unexpected in pinstripe history. Filling in for the injured Randolph, Doyle batted .438 in the six game victory over the Dodgers. This guy never averaged higher than .192 during a regular season with New York. If you’re not old enough to remember Doyle, think about a player with abilities similar to Ramiro Pena. Him hitting .438 in the biggest baseball show on earth would be like if Pena had taken over for the injured Derek Jeter in the 2012 ALCS and led the Yankees to the World Series with his hitting. In other words, Doyle’s performance was shocking, especially since it took place in the national spotlight of the World Series. Brian is the brother of former big league infielder, Denny Doyle. Together, they and a third brother, Brian’s twin named Blake, run the very successful Doyle Baseball Camp program. Graduates of the program include, Gary Sheffield, J.D. Drew, Brian Roberts and Tim Wakefield. 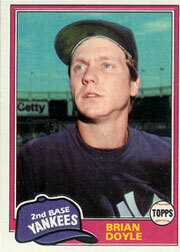 Doyle shares his January 26th birthday with this former Yankee pitcher. 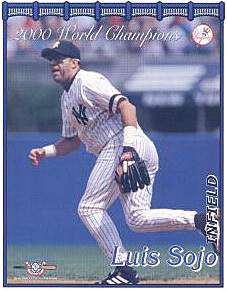 Luis Sojo was one of my favorite Yankees. He had that wonderful ability to sit on the bench for most of a game and then grab his glove and instantly make a difficult play look easy from any infield position. I also would get a kick out of his rumpled appearance in a Yankee uniform, which always reminded me sort of the way Yogi Berra looked in pinstripes. The Yankees first got him off waivers from Seattle during the 1996 season and the following year, the native Venezuelan took over the starting second base position from Mariano Duncan. When the Yankees acquired Chuck Knoblauch from the Twins to play second in 1998, Sojo became the team’s reliable utility infielder. After the 1999 season, Luis signed as a free agent with the Pirates but when Knoblauch’s strange throwing problems peaked, New York traded to get Sojo back in August of 2000, setting up his most magical moment as a Yankee. That came in the ninth inning of the fifth and final game of that season’s Subway Series. With the score tied 2-2 in the top of the ninth, Sojo came to bat for the first time after being inserted to play second base in the previous inning. His ground ball single through the middle off of Al Leiter scored Jorge Posada from second. Scott Brosius also scored on the play when the throw home trying to nail Posada was way off the mark and the Yankees were once again World Champs. I was thrilled for Sojo. The guy won four rings as a Yankee. He then became New York’s third base coach for a couple of seasons and until last year, managed the Yankees Tampa Minor League club. Today is also the birthday of this former Yankee pitcher and this colorful pre-WWII outfielder.